Instant adhesives, usually cyanoacrylate (Super Glue® being a famous example), set and cure very quickly. They are most often used within the screen printing industry to bond mesh to frames during the stretching process. DynaBond Super Adhesive is an easy to use cyanoacrylate adhesive system that binds virtually all types of mesh to any type of frame. It is available in a range of viscosities designed to work with a wide variety of mesh counts. To use, simply stretch the mesh to the desired tension and apply DynaBond to the screen with the squeeze bottle, making a fine bead. Then, spread the adhesive evenly with a card, and optionally, apply an adhesive primer like DynaBond Aerosol Activator. This will dry DynaBond within 20 seconds. 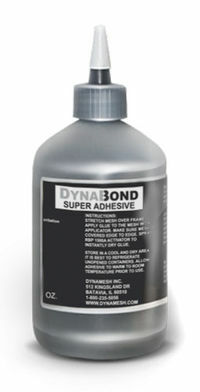 DynaBond Super Adhesive Activator is an adhesive primer designed to work in conjunction with cyanoacrylate adhesives such as DynaBond Super Adhesive. It “primes” or activates the adhesive to form a quick and permanent bond. It also ensures consistent curing each and every time. In particular, the DynaBond Activator 10 oz aerosol spray helps eliminate “surges” associated with pump spray products that can contribute to overlaps and missed spots, weakening the bond. RBP 1200 is a water-soluble, non-hazardous priming accelerator. 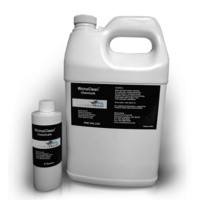 Adhesive primers, such as RBP 1200, are used to enhance and accelerate the cure speed of cyanoacrylate adhesives such as RhinoBond™. They permit fast, efficient bonds in a high speed production environment. The cure mechanism is very simple. Adhesive is applied to one substrate and the primer is sprayed or brushed onto the other substrate. Curing occurs immediately when the two parts are joined.